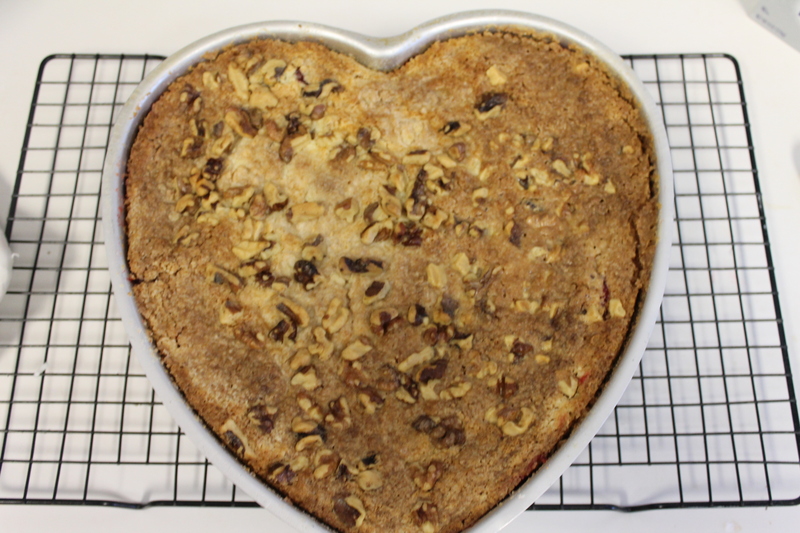 It’s February, and every breathing moment (including those times in the middle of the night when I have a stroke of genius that I can never remember the next day) is spent thinking about Valentine’s Day goodies. I spend a lot of time mentally creating and baking…thinking up new twists and embellishments. My grandfather was a professor of engineering and a woodworking genius who was a huge believer in the “measure twice, cut once” practice. I’ve learned that actually imagining myself making a new creation, step by step, helps me avoid a lot of mistakes. Not all…but a lot. One of these ideas has actually come to fruition! And boy, do I have an easy dessert for you! Seriously easy, not just easy compared to my usual fussing and experimenting and generally doing everything the hardest way possible. 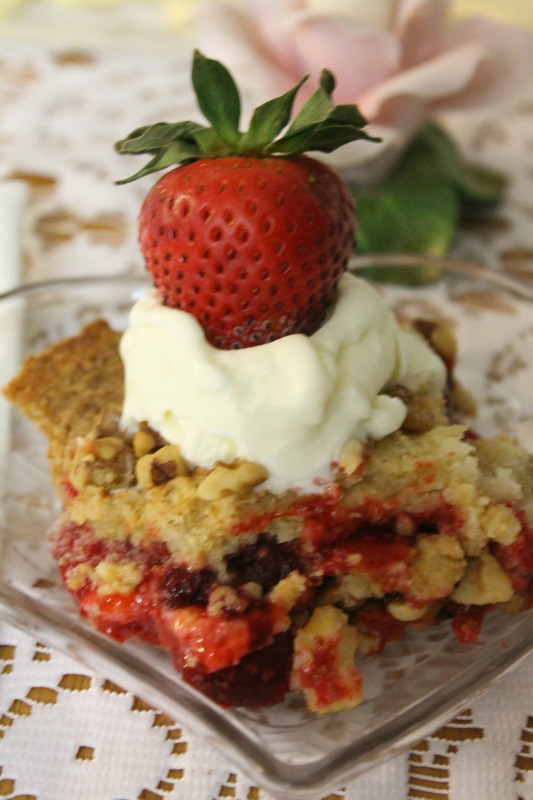 This is a “dump cake”, but it’s actually more like a pie, with a layer of cream cheese, a layer of strawberry, and a crunchy-buttery topping. I will give you the recipe for the topping, but if you want to use a boxed white cake mix, go for it. Personally, I like avoiding the preservatives, and it’s so easy to make the mix that I don’t mess with boxed mixes at all. Eat this warm with a scoop of vanilla ice cream. Sheer bliss! 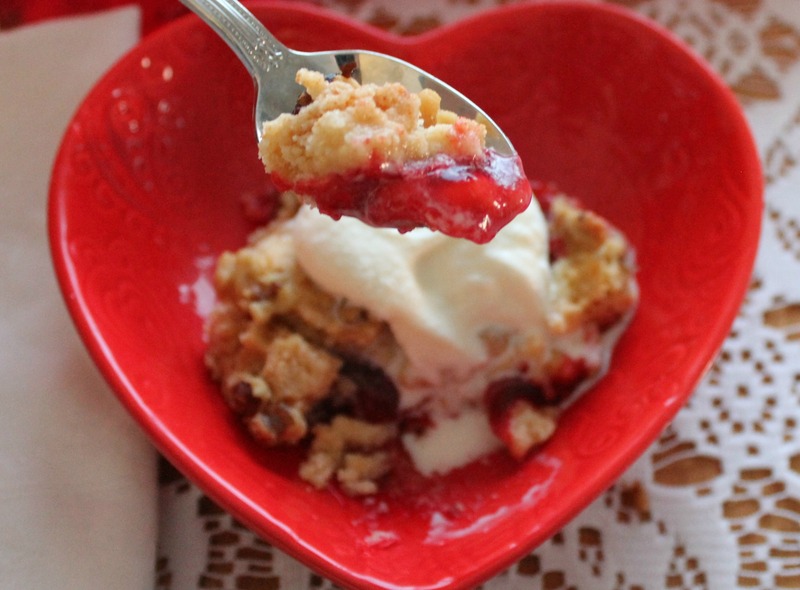 This is a "dump cake", but it's really more like a pie with 3 layers: Cream cheese, strawberry, and crunchy topping. Serves 9. Prepare a 9-inch pan or casserole dish. 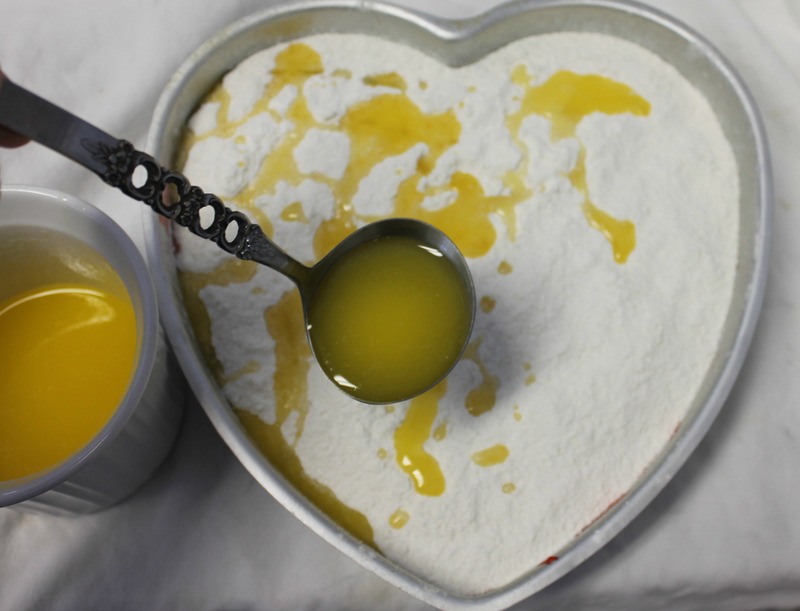 (or a 10-inch heart-shaped pan) by greasing and flouring it or using an oil/flour spray like Baker's Joy. In a medium bowl, combine cream cheese, powdered sugar, egg, vanilla, and flour and mix at medium speed until well combined and creamy. Spread into prepared pan. 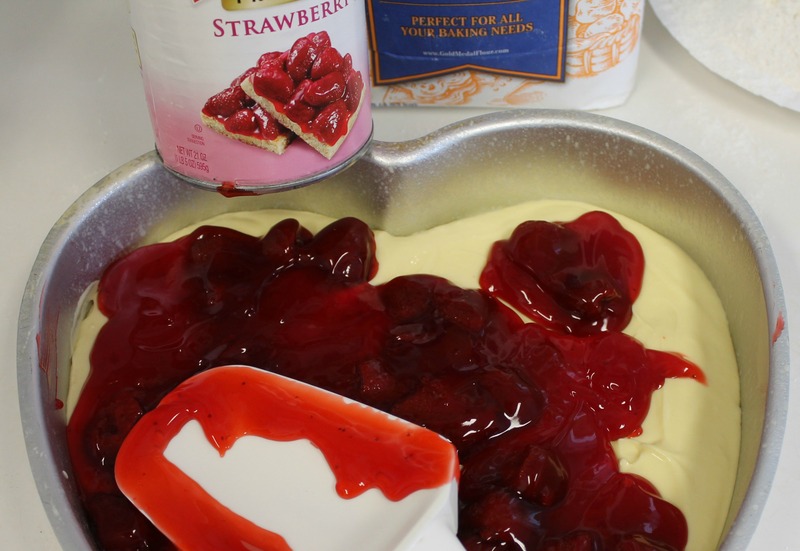 Spread the strawberry pie filling over the cream cheese mixture. It's easiest if you evenly distribute dollops of pie filling and then spread with a rubber spatula. Cover the strawberry layer with all of the dry cake mix. 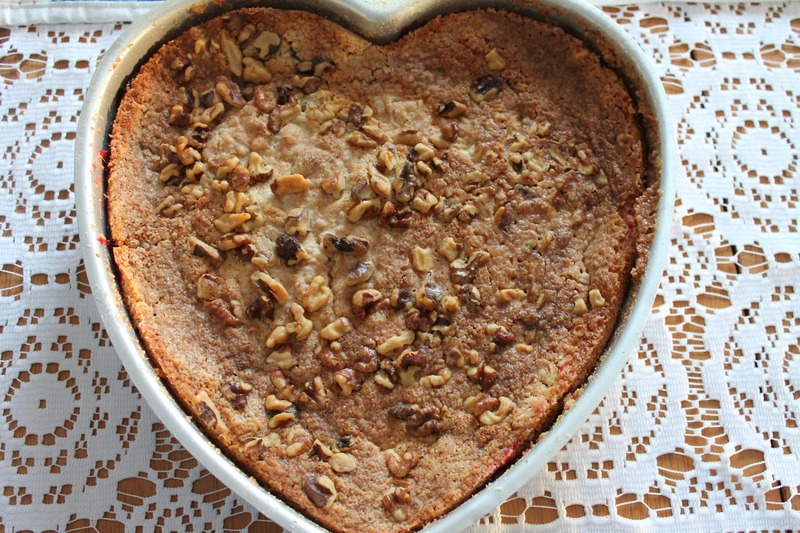 Drizzle melted butter over the cake mix and sprinkle with walnuts. 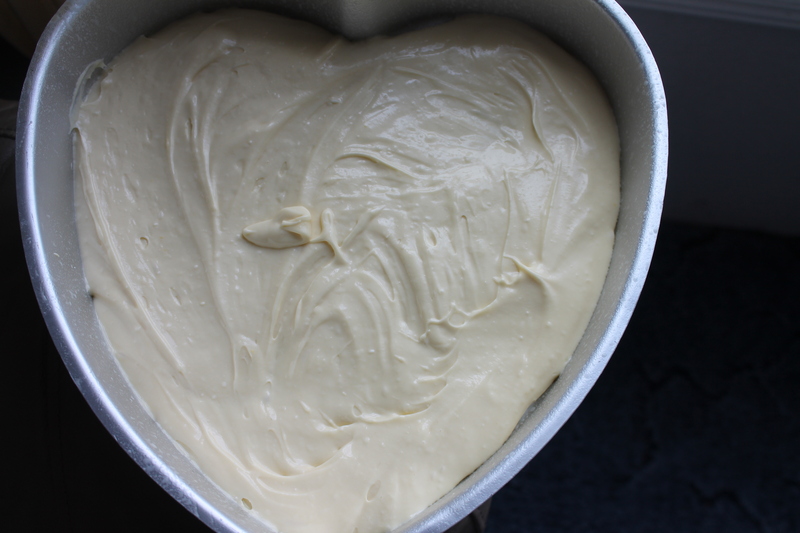 Bake for approximately 50 minutes. The top should be golden brown. It will continue to darken a little while it is cooling. Cool on a rack and serve warm with a little vanilla ice cream. Add the strawberry pie filling. Cover with dry cake mix and drizzle with butter. Add walnuts. Don’t let the photo deceive you; by the time you drizzle on all the butter, it will resemble a lake of butter with a few tiny white islands poking through. Don’t worry…the butter will soak in and turn that cake mix into a delectable, crunchy topping. It will darken and sink in a bit…that’s OK! This recipe is very similar to one I posted this fall, which became one of my most viewed posts. It’s funny – I’ll spend days working on what I consider a great recipe, and yet a simple dessert gets all the action on Pinterest! If you like this recipe, you’ll want to check out my Pumpkin Cream Cheese Dessert too. Now…chocolate! I need chocolate! Let’s see what I can dream up this time. This entry was posted in Desserts, Pies! and tagged dump cake, strawberry cream cheese, Strawberry dessert, strawberry dump cake, strawberry valentine dessert by Lorinda. Bookmark the permalink. Wally World 😉 You’ll love this one. I think next time I might try putting some chopped strawberries in there too. Sounds amazing and so easy. Can’t wait to whip this one up. Easy Peasy! Not the prettiest dessert, but it just doesn’t matter once you take a bite. I’m a sucker for crunchy toppings.